Everyone’s favorite spooky holiday season is here, and Alabama is brimming with places and events to help you celebrate all month long. From stocking up on your favorite candy to picking out the perfect costume to venturing into dark forests or corn mazes for a scare, there are endless festivities to create an amazing Halloween experience. Your perfect Halloween in Alabama begins with these 10 must-do activities. The prime spot to stock up on your favorite sweets IN BULK, Sugar Inc. is a must-visit during the Halloween season. Inside you’ll find apothecary jars brimming with all the classics, including jellybeans (separated by flavor, of course), gummies in all shapes, sizes, and colors (including gummy TEETH! ), candy corn and similar treats, and all sorts of other spooky-themed candies that are ripe for the occasion. Who needs trick-or-treating when you can stock up here for much less work? Set in a town named Killen (no, that’s not a typo), the Arm Mortis delivers twice the thrills in a single location. Translated as “The Castle of Death,” guests can take their pick of haunted house or zombie killing spree. The attraction has been around for some time, but each year brings a new, spooky experience that anyone who loves a good scare won’t want to miss! This haute fine dining facility turns into a nightmarish scene with its Peaches and Scream spectacular. 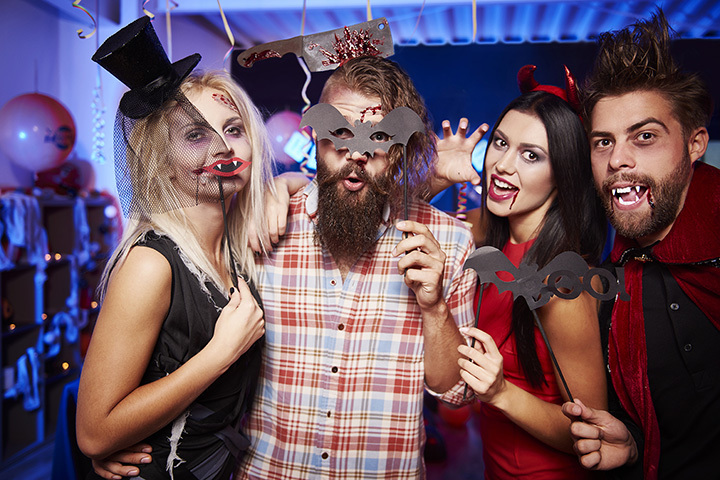 Each room in the venue provides a different Halloween theme, complete with head-pounding music, dancing, Halloween-themed cocktails, glow sticks, and costume contest. Enter if you dare, but beware: an amazing time awaits all who attend! It just isn’t Halloween without costumes. Halloween gives us a chance to become whoever (or whatever) we choose—are you ready to play your part? Whether you prefer theatrical-quality costumes or costumes for one-time wear, you’ll find the perfect ensemble here. If you don’t want to have something else taking up your closet space, you can also rent an amazing get-up here—no storage requirements! This charming little boutique hotel has a wicked history, making it the perfect spot to spend a night during Halloween season. Built in 1837, the hotel served as a meeting spot for Civil War soldiers to dissect battle strategies. During the Battle of Selma, nearly the entire town burned to the ground, yet the hotel remained. After the Civil War ended, famed outlaw Jesse James and his gang stayed the night, and his ghost is rumored to periodically appear alongside his girlfriend Lucinda and his dog, especially in rooms 214, 314, and 315. Lavender was Lucinda’s favorite, and guests have reported smelling hints of it in the air. If you want to experience some of the state’s most haunted locales, head to Tuscaloosa and embark on the Haunted Tuscaloosa Tours. Tour guides take you to some of the area’s hottest haunts, including the Drish House, Greenwood Cemetery, Bama Theatre, and The University Club (locations vary by tour). It’s 90 minutes of hair-raising true stories and bone-chilling sightseeing. If you’re stealthy enough, you might even glimpse a ghost or two. Nothing says Halloween-in-the-south like a good ol’ fashioned punkin chunkin. Benefitting the Make a Wish foundation, this event features group and individual punkin chunkins (if you aren’t familiar with the term, it’s literally hurling a pumpkin as far as you can using a mechanical device), costume contest, carnival games, and other fun. If you’re looking for a little family-friendly entertainment that won’t scare the bejeebies out of you, the annual Halloween Craft Fair provides a tamer experience that’s suitable for all ages. Each vendor booth features something Halloween-ish, including homemade crafts, face painting, and other fun activities. If you’ve never tried an escape room (or have tried them and can’t seem to get enough), Halloween season is the perfect time. You can pick between different themes, each one giving you a unique experience as you work with your team to solve clues and find your way out of the room before time runs out. If you win, you get to go free. If you lose…. Well, let’s just hope you win. The zombies are coming - can you take them all out before they feast on your brain? In this Walking Dead-esque game, players are armed with paintball guns, then taken on a ride to shoot down the zombie/clown mob and escape with their lives. Make sure you don’t run out of paintballs too soon—it might cost you dearly.